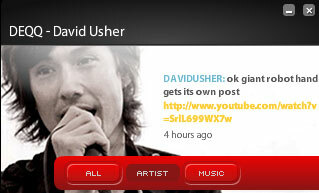 Montreal-based musician David Usher is spearheading the development of a new social media application specifically tailored to help artists manage online communities and share or sell their work online. Emblazoned on the right-hand column of DavidUsher.com sits an embedded Adobe AIR client. 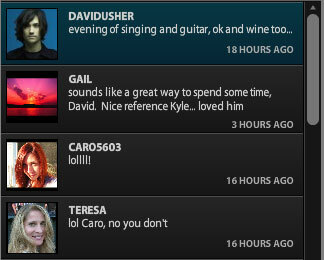 A stream of short messages next to user pictures is similar to Twitter, but there’s more here. Users can begin threaded discussions around any given message, or click on a tab and start streaming Usher’s tracks, free of charge. Most notably, the whole application is branded to be distinctly about the solo musician. Deqq allows musicians to brand a channel of social media interaction. Deqq is the application that will attempt to do just that. It has been developed by Vancouver-based social media company Work at Play. It’s inspiration came after founder David Gratton met Usher at the 2008 Mesh conference in Toronto. The duo were on the same panel discussing music and social media. Work at Play has developed other social media applications related to music, including a project for MTV. But the company didn’t have the benefit of a social media-savvy artist directing them on what other musicians needed from an application. Usher then took on a role as a beta tester for the product, releasing the first beta version on his site in March. It can be accessed in the Web site, or as a separate client download. Deqq allows Usher to syndicate his messages to Twitter and Facebook. He’s also able to stream video directly through the application, and is currently streaming music for free. But the option to sell mp3 downloads to fans is also there, Gratton says. Musicians can set the prices on their songs and collect payment via credit card over the application. Threaded conversations can take place around each post in Deqq. Deqq is now being handed off for further development to another company owned by Gratton, Project Opus. The underlying architecture of the program is a communications server that can be connected to a graphical interface. Adobe AIR was chosen for the client because it is supported by multiple operating systems. AIR has been the foundation of many social media clients, including the popular Seesmic Desktop and Tweet Deck. It was developed to allow Web applications to break free of browser limitations, says Adrian Ludwig, group product marketing manager with Adobe. Social media applications using AIR have similar features, he adds. All of them sit in the background and are constantly available for the user to open, and alert her or him when new messages arrive. Facebook did some prototype work with AIR when it was developing its notifications system. The platform makes it easy for small teams of Web developers to build applications that work well and are user-friendly. Developers also have the advantage of building something once, and having it work across different operating systems and even on mobile phones, he adds. Deqq is currently available only a desktop client, but other applications are being considered for the future, Gratton says. For Usher, it’s significantly changed the way he uses social media. He updates his Twitter and Facebook feeds using Deqq now, and finds he is using MySpace less lately. He’s also talking with fans so much on a real-time basis that he blogs less. But he prefers the type of communication provided by Deqq. Despite subscribing to a community that is completely based around Usher, fans seem to get by fine on their own. The musician was recently absent from the social media scene when he took a two-week vacation to Norway, but traffic on Deqq declined only marginally as users continued on their own conversations. There are between 500 and 1,000 new messages a day on the channel. That feedback may soon benefit other musicians. Various artists have voiced interest in Deqq and may soon be providing their own content channels, Gratton says. Users would add these different communities as channels to their Deqq application, as opposed to downloading and installing a different application for each artist.